This one's so easy. Sheila , my friend who always swatches, donated the swatch from a scarf she made for a Princeton alum; black and orange are their colors. It is good, old stockinette. *Knit a row, Purl a row* Repeat till size desired. Fold swatch was in half, join the seams. To wear as an amulet necklace, I made a two color braid from the black and orange yarn. Vintage button attached to one end, other end looped to form buttonhole. Attach to each edge of the amulet. 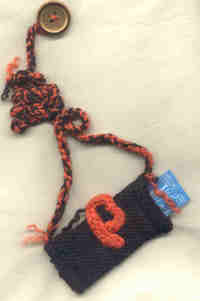 The I-cord technique was used for the letter "P." (On double-pointed needles, cast on two or three stitches Do not turn! Slide stitches to other end of needle, knit. Slide again to other end. 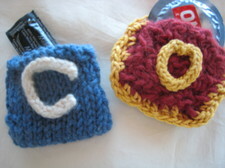 Continue till desired length, cast off) Duplicate Stitch is another way to make letters. Two more Condom Amulets in the college series with safety-pin backs. Oberlin, crocheted in honor of my own alma mater and Columbia for the university down the street from my home... where we distributed 500 New York City condoms at the 2006 Law School graduation! University of Utah would work for a larger amulet to fit the female condom on this page. Looking forward to your collegiate creations. Leave a comment at A Little Red Hen on how you fit them into the curriculum.